Parking Hand tags are made to identify permitted vehicles by hanging on the mirror visible through the windshield. Made of durable, yet flexible polyethylene, our tags can be removed and used on different vehicles — perfect for temporary parking control. 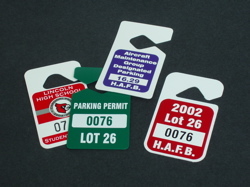 In larger quantities parking tag info is screen printed to the tag or in smaller quantities placed as a thermal printed applique. Consecutive numbering is available to your specifications. Reflective or prismatic eye catching features are also available. For more information on parking hang tags contact us.